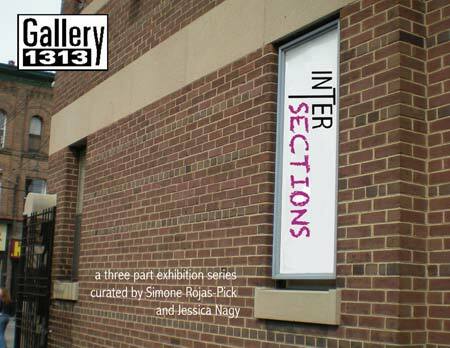 After four fantastic exhibits, Intersections has now closed at Gallery 1313. But don’t forget that the Launch Pad project continues this month with the opening of the second series, To Be Moved. Curated by Chelsea Omel, these next three exhibits are not to be missed. You can check out her exhibit blog at tobemoved.wordpress.com. Simone and I would like to extend many thanks to all of our amazing artists as well as to Gallery 1313’s director, Phil Anderson and Launch Pad co-ordinator, Elizabeth Underhill. Stay tuned for more images and artist bios coming soon! After three great exhibits, why not go for four!? After the success of Intersections, a three-part exhibition series organized for the Gallery 1313 Window Box, we are extending the series by an additional month. 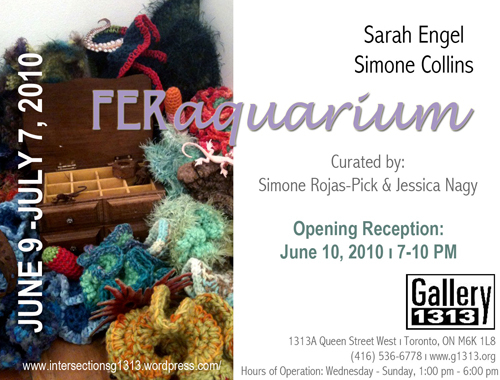 We are currently accepting creative proposals from emerging artists for our exhibition series, Intersections, taking place in Gallery 1313’s Window Box, from May 2010 – September 2010. Intersections is centred around the concept of the “mash-up”; where two or more voices/mediums/styles are combined to create a single work. The focus of these exhibitions is on the changeability of environment and exploring the limits of creation. We extend the challenge to artists to forget accepted “rules” and work in a fashion that includes an understanding of flexibility in relation to the immediate environment. This approach should bring about new and exciting projects that push beyond the restraints of the traditional gallery milieu and the confines of set artistic disciplines. Artists are welcome to submit work in any media, including but not limited to: drawing, painting, photography, sculpture, installation, participatory, performance, video, and new media. Artists should note, however, that sound elements are discouraged due to the limitations of the box. This series encourages artists to push the boundaries of their comfort zones and take the opportunity to experiment with new mediums or styles. Keeping with the theme of the “mash-up”, artists applying collaboratively with significantly different practices will be given special consideration. Artists applying independently may be matched, by the curators, with other applicants to produce a collaborative work. Deadline for submissions is Friday July 16, 2010. FERaquarium opens this Wednesday, June 9th! Welcome to Intersections Online; your complete source for all the events and info you’ll need for the next few months! Here you’ll find everything you needed to know about our Curatorial Vision, The Artists and what they think about this project and their collaborative experience as well as details on openings and other events we’re organizing at Gallery 1313. Be sure to subscribe to the blog so you get all the updates as they happen! 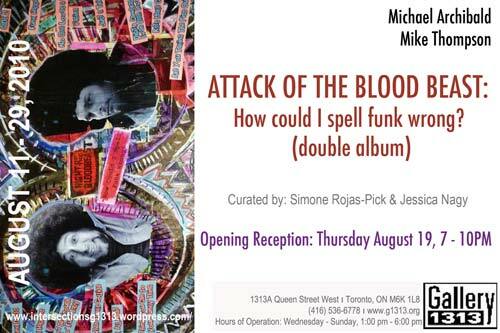 Thanks for stopping by and we hope to see you at the gallery!